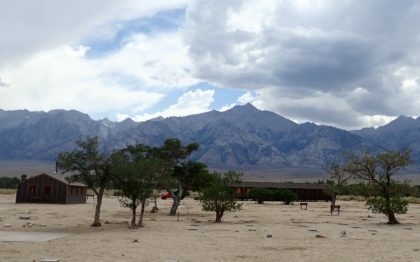 Manzanar National Historic Site in California preserves a “relocation camp” but many would refer to it as an internment camp or even a prison camp – something we certainly hadn’t expected to see in the United States. 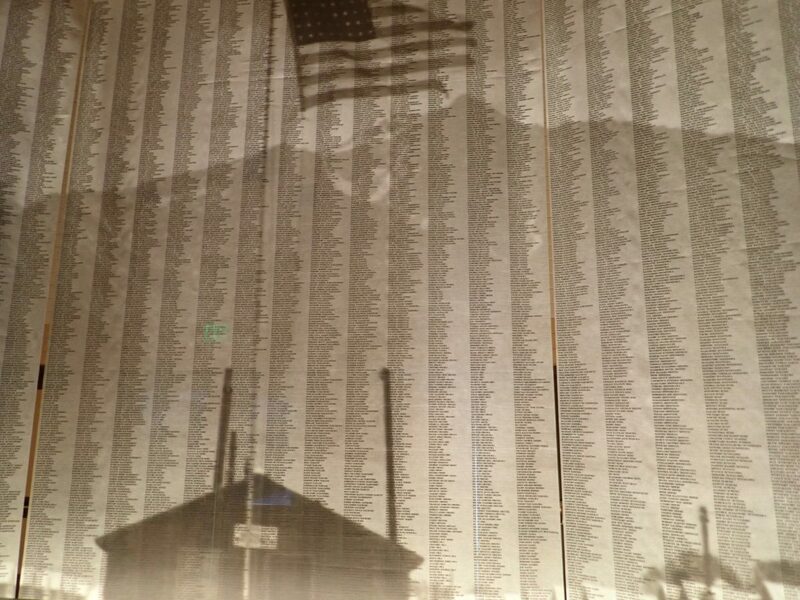 6200 acres in the Owens Valley surrounded by barbed wire, Manzanar housed over 10,000 people between 1942 and 1945 – over 70% United States citizens – in 36 blocks of military style barracks. After the bombing of Pearl Harbor, there was increasing resentment and fear of the Japanese-American population in California and the other western states. On February 19, 1942 United States President Franklin D. Roosevelt signed Executive Order 9066, authorizing the Secretary of War to remove any or all Japanese from the west coast. Subsequently, 120,000 people were moved to 10 relocation camps in the interior of the country. Not convicted of any crime, other than their heritage, Japanese Americans and Japanese aliens were rounded up – men, women and children – and sent to these camps. They were told that they weren’t prisoners, even though surrounded by barbed wire. They were told that they were brought to these camps for their own protection, even though the guards had their guns pointed inward at the “residents” rather than outward. Imagine – today you go to work or school, enjoy your home, visit friends and neighbors, live a simple life. Then, the government – your government – rounds you up and sends you far away to live in a 20 x 100 tarpaper shack. 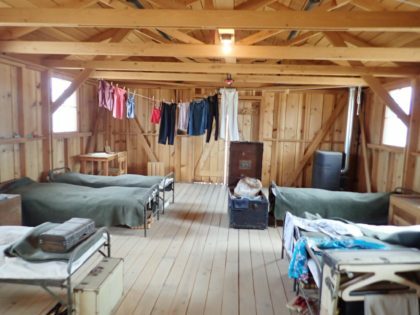 Multiple families sharing the same building with no privacy, where they had to endure communal bathrooms, “mess halls” with military-style rations and limited medical care. So where is the good in this? We saw it as a testimonial to the resilience and inner fortitude of people. Rather than simply give up, the people in these camps worked hard to make life better. They worked to plug the gaping holes in their barracks to protect themselves from the elements. They rigged blankets to separate their living spaces to get a little bit of privacy for their families. They built furniture from scrap lumber and discarded crates. And they planted gardens – a victory garden for food and relaxation gardens where residents could, even if just for a moment, forget their surroundings. The kids went to school. They started clubs. They played baseball. They had a jazz band and hosted dances. They got married, had children. And they didn’t stop being Americans. Far too late the American government finally did try to make it right. In 1988, President Ronald Reagan signed the Civil Liberties Act. This offered a formal apology and paid $20,000 in compensation to each survivor of the camps. 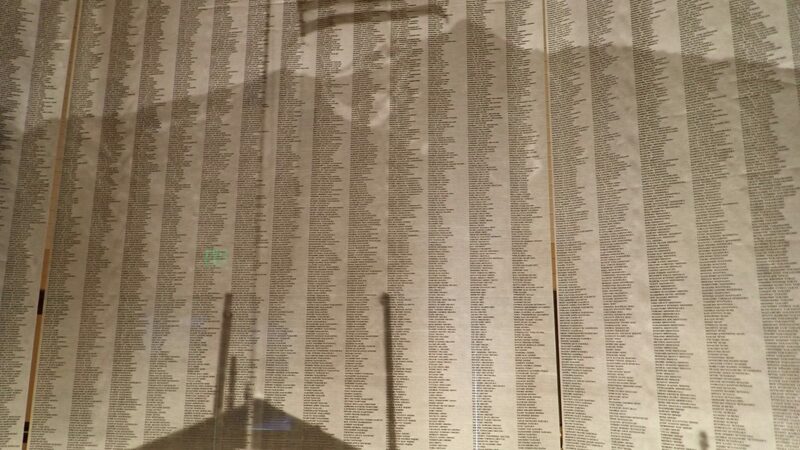 Looking at this from a different perspective, one of things we learned was that even though there was a very large population of Japanese-Americans in Hawaii, where the attack took place, there was very little discrimination there and very few of the Japanese were rounded up. There, they were considered part of the fabric of the community. Many say that on the mainland, much of the resentment had been building towards the Japanese because of their successful businesses. So it wasn’t just the war… that may have been the breaking point. The sad thing was that everything that they did under the guise of Executive Order 9066 was against the constitution of the United States. These were citizens of the United States, imprisoned without due process of law. There were over a dozen protections guaranteed by the US constitution that were conveniently ignored. Conditions in the camps sucked… When they first moved in, the barracks weren’t even complete. It was up to the first “volunteers” who arrived to finish them – seal the cracks in the walls, build steps up to the doors, fix the leaky roofs. The location wasn’t chosen for comfort… the temperature varied from freezing and hot, with winds that blew the never-ending dust through every crack. Nothing about the camp made life easy. Terrible conditions, family separation, lack of privacy, loss of self-worth and hope did force some to suicide and others to resist. Finally the government began letting people leave, but only if they could show they had a job and a sponsor. In 1945 when the camps closed, those who remained were given $25, one-way train or bus fare and some food. Many left, but many had nowhere to go and refused to leave what had become the only home they had. So once again the government forcibly moved them. Manzanar is a good reminder … as one of our friends said “those who don’t remember history, may well repeat it.” We hope not. We would highly recommend it for a visit. It’s easily accessible off the 395. The visitor center is in the old dance hall, with a good movie and very interesting exhibits. We were particularly interested in the panels that talked about how Canada and Latin America also discriminated against the Japanese at that time. Many Latin American countries sent their Japanese to the US relocation camps. Canada expelled all of them from British Columbia, stripping them of their homes and businesses and sending them inland to internment camps and farms – some there until 1949. It was a part of Canadian history we weren’t aware of. After the visitor center, take a look around the reconstructed barracks, privies and mess hall. There are tons of interesting stories here. Then take the 3 1/2 mile self-guided tour around the periphery of the camp. It is still ringed by barbed wire and you can see the old guard tower at the gate. The drive really gives you a vision of how large it was. We were there in 100+ heat, so we drove, but it would be a lovely walk or run in another season. Be sure to plan some extra time just to talk with the rangers. They were really interesting to talk with and helped give a much better perspective on what we had seen. They know so much more about the park than you can possibly learn by simply looking at the exhibits. We always try to engage them and hear what they find interesting about their park. One of the interesting stories they told us was about the pay rates. Most of the people in the camp did jobs and were paid a pittance. The highest paid couldn’t make over what the lowest paid military member was paid, so the maximum pay was $19 per month. That’s what an internee teacher was paid, compared to a teacher coming in from outside the camp who was paid $250 per month! 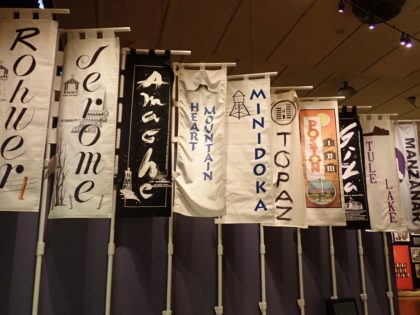 If you want to learn more about the Japanese interment, there were actually ten Relocation Centers, some of which you can still visit today. 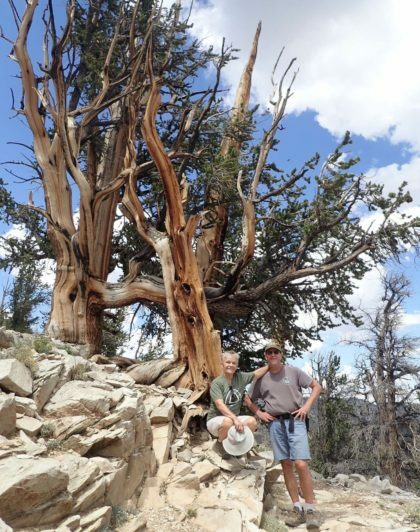 While you are in the area, we highly recommend taking a detour to see the ancient Bristlecone Pines National Forest located 45 minutes east of the 395, south of Bishop, California. These trees, growing only at 10,000 feet and above, are the oldest growing things on the planet. At least one has been dated to 4,600 years old and is still alive. They grow best when conditions are worst – taking root on Dolomite rock and thriving because nothing else can live there! Their tough skin and resilience made us think of the Japanese who found ways to thrive in the harshest conditions.